Below is a reprint from a paper that I had written on appraisal practice as it relates to lower priced internet sales. Some of the terminology is geared toward industry professionals, however I believe there are items of interest in the paper relevant to all consumers, particularly appraisal value vs selling price at low margin retailers. I hope you enjoy. The rapid expansion of internet jewelry sales over the past several years has had a broad impact on the way jewelry is bought and sold in today’s market. According to the 2013 annual shareholders report from Blue Nile Inc. , one of the largest diamond jewelry retailers on the web, the company saw total revenue jump from approximately 333 million dollars in fiscal year 2010 to approximately 450 million dollars in fiscal year 2013. The company also reported a gross profit of 21.6% in 2010 compared to a reduced profit of 18.6% in 2014. The increase of roughly 35% in revenue indicates robust growth in that sector, however the numbers indicate that the growth came at a cost of nearly a 14% decrease in profit. This paper will discuss both the positive and negative aspects of the rise in internet sales as they relate to the consumer and industry. Secondly, an analysis of the challenges presented to the professional jewelry appraiser related to the rise of lower margin internet sales will be examined specifically with an emphasis on appraisal value vs selling price. 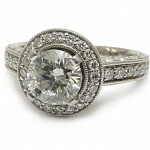 Increased competition from the growth of internet jewelry sales can be viewed as mostly a positive for consumers. Many larger online only sellers have cut their margins to win market share. This decrease in the price, particularly in the diamond sector, has lead to an increase in competitive pricing models across many traditional retailers. The competition is evident in some of the largest big box chain stores price matching the competitive pricing found on the web. This same phenomena is prevalent in other high dollar consumer products where the customer gathers information on the web but then actually makes the purchase at the more familiar retailer. This process can also work the other way to the detriment of the traditional retailer. Some internet savvy consumers will look at actual products in a store only to find a better price online for the item they decide on. This challenge to the retailer has been dealt with in creative ways including increased prevalence of product branding as well as price matching. Strong evidence for the general health of the traditional retailer is showcased by Signet Jewelers Limited 2013 annual report. During the same reporting period as Blue Nile Inc., Signet (the largest specialty jewelry retailer in the world) posted revenue gain from approximately 3.27 billion dollars in 2010 to 3.98 billion dollars in 2013 for a gain of 21.7%. Perhaps even more interesting is that the gross profit rose from 32.6% to 38.6% while at the same time Blue Nile was loosing margin. It is important to note that these two examples, while showcasing some of the largest players in their space, do not bear out to all retailers. It does illustrate, however, that the traditional retailer can thrive and increase margin in the modern market place. The prevalence of the online discount retailer has been both a boon and bane for the professional appraiser. The conundrum of assigning the most appropriate market is not completely new. Lower margin diamond “brokers” and jewelry “wholesalers” to the public are decades old. It is a common occurrence to see inflated appraisals issued by such retailers to underscore the “value” that has been afforded their customers. The complexity arises because of the scope of the internet retailer. No longer is the isolated and often high margin jeweler in small town USA immune from the reach of the diamond discounter. The internet based jeweler is operating on the national level and in some cases beyond. Information about diamonds jewelry, vast selection and price comparisons are now at the fingertips of every consumer with internet access. The problem as it concerns the professional appraiser is determining the appropriate market for researching value. It can be reasoned that because of the wide reach and product availability of internet based firms that it would be appropriate to consider this market level a universal standard. Conversely, researching the actual geographic location of the consumer to establish the valuation of an item readily sold in their locale has been the gold standard of appraisal methodology. Each method described has merit and is appropriate for various situations. The issue becomes less clear when the item is actually purchased online for a competitive price and the client seeks an independent valuation to obtain insurance coverage. It would seem logical to use the same market to research the replacement cost. Situations do arise as many consumer will be disappointed if the perceived “value” received by the online vendor was not verified by a higher replacement cost in the appraisal. The preferred course of action is to disclose this issue to the appraisal client during the initial client interview. The various market levels should be explained to the client along with the various replacement policies issued by insurers. Information regarding the differences between a typical replacement policy and the less common as agreed policy should by disclosed to the client. It is important to state that all policies are different and that the client should always seek clarity from their insurer. In my experience a majority of clients will want the higher value assigned to their item. The problem is then one of ethics. Is it reasonable to assign a higher value to an item knowing that it was purchased at a lower market level. In this situation I would argue that it is. It is not only ethical but preferred. The argument for choosing local pricing over the internet price that was paid is supported by several appraisal principals. When deciding where to replace an item that is under claim it is reasonable for the client to opt for an “arms length” transaction. In other words, a purchase made in person at a traditional retailer. Even when the original purchase was made at an online retailer the argument can be made in the case of a replacement that the item in question needs to be viewed and agreed upon by the client to assure that they are receiving comparable merchandise and made whole to their satisfaction. It is also a common and accepted practice to seek the modal retail value for an insurance replacement appraisal in the clients locale. This argument is strengthened by the actual numbers. The largest internet resellers of jewelry are still only a fraction of the overall market share of jewelry sold in the US. According to a De Beers study cited in JCK magazine on June 12, 2014 only 18% of all diamond jewelry sales are made on the web. It is also reasonable to conclude that some of those online sales are from the websites of traditional jewelers indicating that less than 18% of all diamond jewelry is sold by lower margin web only retailers. It is highly improbable that a modal value could be found mathematically if the number of total sales is disproportionately lower. This second point to the modal argument is ancillary to the greater point of finding the proper value for the client in their geographic area, however it is a logically sound proof. Internet based jewelry sales have been growing robustly and will most likely continue to grow well into the future. Many savvy traditional retailers have risen to the challenge by embracing technology and social media while strengthening their strongest asset, the innate advantages of the more intimate personal sale. Those retailers who continue to adapt will find themselves caught in the rising tide of the overall increasing market awareness the internet has brought to bear. The web has provided the professional appraiser with a very powerful research tool which has the dual effect of simultaneously making our jobs both easier and more difficult . The ease at which auction results, designer pricing and general research can be performed was not obtainable just a few short years ago. The difficulties lie in the proliferation of “value” based retailers who are often legitimate but sometimes not. The professional appraiser is now tasked with not only verifying the merchandise’s authenticity but also determining yet another market level to fit into the hierarchy. It is my opinion that appraisal assignments should begin with a thorough interview. It is by this process that the needs of the client are determined, often with the knowledgeable insights of the appraiser to help inform them. In the case of determining the proper market for deeply discounted jewelry’s replacement cost it is ultimately up to the client. Once they are informed a proper appraisal can be written to fit their needs. It is my position that the value for the replacement of the merchandise in question should by default be the modal value as found in the clients locale. Clients will appreciate the appropriate higher value in most cases. Exceptions to this position can be used when circumstances call for it. Some collectors that have a watchful eye on ever rising premiums may wish to have a more conservative approach taken. This can easily be accommodated for and noted in the appraisal when this less common situation arises. Next Next post: ARE DIAMONDS, GOLD AND JEWELRY A GOOD INVESTMENT? ARE DIAMONDS, GOLD AND JEWELRY A GOOD INVESTMENT? Please consider making a donation to help fund our ongoing and independent research. We are not directly affiliated with any retailers nor do we rely on advertising dollars. We are completely funded by people like you. The information provided in this web site as well as the links found within, all the subsequent pages attached and communications resulting from its use, herein referred to as the “Information”, are restricted to the use outlined in this Terms and Conditions of Use Agreement. The American Jewelry Institute LLC, herein referred to as (Company), presents the Information in good faith to you, herein referred to as the User. The Information presented by the Company to the User is for educational and illustrative uses only and is not an appraisal. The Company nor its agents are acting in the roll of an appraiser and any values and opinions if given shall not be considered an appraisal. The use of the Information is restricted to the use stated and is not a guarantee or warrantee of any kind. The User shall indemnify and keep indemnified the Company and its affiliated companies, and their agents, employees and officers against all liabilities and expenses incurred as a result of the use of the Information. The Information shall remain the copyright of the Company and shall be used only by the User and not reproduced or published in any form without the Company’s prior written consent. The Information presented may not be used for official or formal purposes such as in legal proceedings, insolvency or bankruptcy proceedings, divorces cases, insurance purposes, or anything such like. Appraisals are offered by the Company and can be arranged separately by mutual agreement with the User. Values when expressed verbally or in writing, do vary from professional to professional, market to market, and there may be a substantial difference between actual sales prices and the values expressed. The Company gives no representation, warranty or guarantee in the information presented with respect to an object’s origin, provenance, attribution, condition, date, age, quality or authenticity. The Company makes no representation or warranty that the object will be able to sell or be replaced for the amount at which it is valued. By using the Information, the User agrees to all of the above Terms and Conditions and assumes all risk associated with the use of the Information.